(Nanowerk Spotlight) Hundreds of millions of liters of deicing agents and anti-icing fluids are used at airports worldwide, about 95 million liters at U.S. airports alone. Because deicers are typically used in very open and exposed outdoor environments, their dispersion begins immediately after application. In a 2012 report ("EPA Environmental Impact and Benefit Assessment"), the U.S. Environmental Protection Agency (EPA) has identified a number of cases in which airport deicing operation discharges to the environment have affected water quality, aquatic ecosystems, and human use of aquatic resources. Ice accumulation is not just a cost and safety problem for the airline industry and other transportation areas, together with undesired environmental impacts. Here are some examples: Transmission lines and power network towers may deform or even collapse with the burden of excess amount of ice; ice accretion on wind turbine blades can cause a production loss as much as 50% of the annual production; frost and ice accumulation in refrigerators and heat exchangers results in a decrease of heat transfer efficiency. Therefore, great efforts have been made to understand the mechanism of icing and investigations on anti-icing and deicing have been extensively carried out. Various anti-icing and deicing methods have been developed such as for instance nanocoatings and other nanostructured surfaces. Unfortunately, conventional methods are often inefficient, costly, or environmentally harmful. Before freezing, anti-icing can be achieved by trapping air in surface textures of superhydrophobic surfaces to promote the rebound of impacting water droplets and coalescence induced self-removal of condensed water droplets. This strategy is valid in particular when the supercooling is low and it takes some time for the supercooled water to be frozen. When icing occurs, an effective anti-icing strategy is proposed via trapping liquids as lubricants between solid surface and formed ice to significantly reduce the ice adhesion. Thus, the formed ice can be easily shed off by an action of wind or gravity. 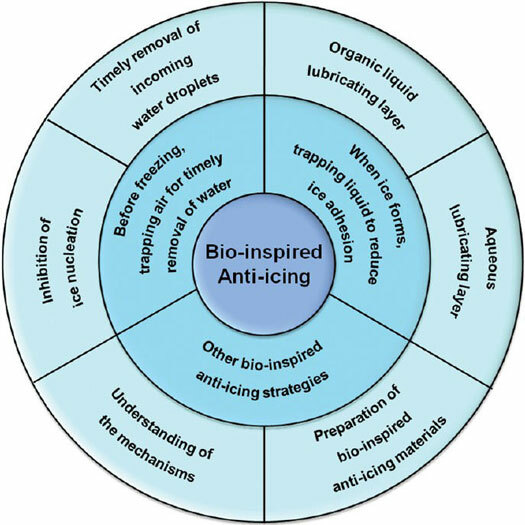 In addition, trapping or introducing other media such as phase change materials and antifreeze proteins are of great potential for anti-icing in practical applications and fundamental research as well. The authors point out that, for practical technical applications, it is often not enough to achieve desired anti-icing effect only utilizing one strategy. Due to the fragility of micro- or/and nanosurface structures, one of the key challenges for bio-inspired surfaces and interface materials is to improve the stability and mechanical robustness. Another challenge is the facile and large-scale fabrication of bio-inspired surfaces and interface materials. Although this review is oriented toward practical applications, there exist fundamental scientific challenges, for example, how to inhibit ice nucleation and growth on solid surfaces, what is the dominant mechanism for the ice adhesion, and how to achieve low ice adhesion surfaces. "All these are scientific challenges with a long history, and some of them have existed for more than 150 years," the authors conclude. "Anti-icing provides an excellent platform to systematically look into all these questions, and this review is expected to serve as a touchstone for further investigations in the future."